The first major pop manifesto to defend the role of the LGBTQ+ collective in culture over the past five decades. The world isn’t only hetero and white. It’s black, Asian, Hindu, gay, lesbian, trans, intersex, bisexual, rich, complex, marvelous, terrible… human. 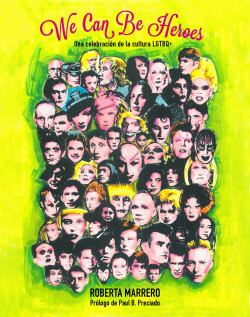 A manifesto that shows us the contributions of the LGBT+ collective to the world of culture in the past five decades: a complex avant-garde movement whose influence on our collective history has been hidden for too long. A book that advocates taking pride in yourself and defends a diverse, plural, and truly egalitarian society beyond gender differences. A book destined to become a reference: this is the first time that this information has been gathered in an illustrated book meant for popular consumption, with biographical details and portraits of each person, an index of names, and a timeline with the most relevant events from each period.